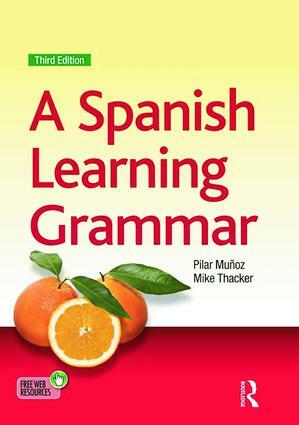 A Spanish Learning Grammar, Third Edition , is an innovative reference grammar and workbook suitable for you, whether you are studying Spanish at intermediate or advanced level. Its straightforward explanations of grammar are supported by examples with contemporary vocabulary, humorous cartoon drawings, and plentiful, varied exercises, helping you to grasp often complex points of grammar in an enjoyable way. Its carefully devised two-part structure mirrors the learning process, allowing you to focus on core knowledge first and enabling you to progress confidently to more advanced knowledge at your own pace. To aid your understanding, this third edition also contains a glossary of grammatical terms, useful verb tables and a key to the exercises. Written in the belief that grammar is the key to real communication, this is an essential textbook for any student of Spanish. MIKE THACKER, formerly Director of The Language Centre, University of Surrey, UK. PILAR MUNOZ, formerly Senior Tutor in the Department of Culture, Media and Communication, University of Surrey, UK.